In the early hours of Nov 4th, Darwinism baited NCdot with a small sub-cap fleet, a carrier, and Dreadnoughts. NCdot responded by dropping six supers, and as they escalated, so did Snuffed Out. “We dropped our load and bubbled their keepstar at the same time,” commented hy_wanto on reddit. NCdot still managed to field 47 titans, 45 super carriers, plus a stream of FAX and dreads. The number of titans on the field was massive with 36 Avatar, 16 Erebus (including the 3 destroyed), and one Vanquisher. Under attack by that amount of firepower, Snuffed Out was still able extract a fair number of assets. While the battle reports have Pandemic Legion listed, their involvement was limited to four ships. The only recorded kills attributed to Pandemic Legion were seven pods. While Darwinism was bait for this operation , they had a reminder for everyone. “Darwinism is no ones pet, that’s why everyone can trust them to help out when required. So if you ever need ‘Piratey’ stuff done, give us a call …” Eye-of-Khanid commented on the actions of Darwinism. It is always nice to have the option to watch these fights and determine the narrative for yourself. Dreadbomb is the use of insured dreadnoughts to overwhelming a high value supercapital target. Both the fleet and pilots expect that most or all of the dreads will be destroyed during the operation. The tactic is based on the theory their massive DPS output will kill several times their value before dying, thus winning the ISK war (or battle). The key here is each dread loss listed in the battle report yielded a net insurance reimbursement of ~1bil (Platinum costing:425,766,336 while paying out 1,419,221,120), so reduce the effective loss accordingly. 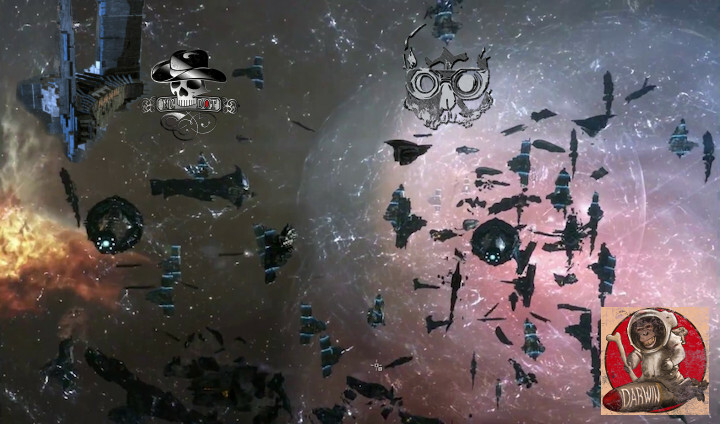 Personally I believe the key here was the attackers allowed a few ships to escalate the fight and closed off the keepstar. Knowing help was so close, but blocked, could have been enough to throw calm pilots off their game. Snuffed Out has a reputation for interesting content generation, but is this something bigger? Possible proof that capsuleers are no longer afraid of NCdot after their showing at X47L-Q? Darwinism pilots out there hit us up, either on social media or here in the comments, we would love to hear more from you! Grammar and spelling errors have been edited. Clips of a Darwinism‘s POV were viewed and the section “Possible Cause” was added to allow a quick summary of the video. Once a full video link is found, we will update. It¡¦s really a great and useful piece of information. I am satisfied that you just shared this useful info with us. Please stay us informed like this. Thanks for sharing. I do accept as true with all of the ideas you’ve offered to your post. They’re really convincing and can certainly work. Nonetheless, the posts are very short for beginners. Could you please extend them a little from next time? Thanks for the post. It is in point of fact a nice and helpful piece of information. I am happy that you shared this useful information with us. Please keep us informed like this. Thank you for sharing. I have a blog site with blog writer. I have actually registered my blog making use of a gmail account. Now, I intend to utilize a new gmail account and also I wanted to import my whole blog site in addition to the messages as well as comments to this new gmail id … Please inform me, is this feasible and also exactly how can it be done?. I as well as my buddies have already been examining the best tips located on your site and so the sudden I had an awful feeling I had not thanked the web blog owner for those tips. My men were consequently happy to learn them and now have undoubtedly been making the most of them. Thank you for truly being indeed helpful and then for going for this sort of cool topics millions of individuals are really needing to learn about. Our sincere apologies for not expressing gratitude to you earlier. Thanks for some other wonderful post. The place else could anybody get that type of info in such an ideal way of writing? I’ve a presentation next week, and I’m at the look for such information. I’m still learning from you, as I’m trying to achieve my goals. I certainly love reading all that is written on your blog.Keep the stories coming. I liked it! I am planning to transfer to Australia permanently. Ideally, my migration process will be finished this year and I will certainly relocate the beginning of 2011. Can someone recommend some superb sources as well as blog sites regarding making the prepare for resolving in Australia?. Great amazing issues here. I¡¦m very satisfied to peer your post. Thank you so much and i am taking a look ahead to touch you. Will you kindly drop me a mail? I do consider all the ideas you’ve offered for your post. They are really convincing and can certainly work. Still, the posts are very quick for novices. Could you please extend them a little from next time? Thanks for the post. Generally I do not read article on blogs, but I would like to say that this write-up very compelled me to check out and do so! Your writing style has been surprised me. Thank you, very nice article. I simply wanted to construct a comment to thank you for all of the splendid concepts you are giving on this site. My rather long internet research has at the end of the day been rewarded with extremely good facts and strategies to share with my contacts. I would tell you that most of us readers are definitely fortunate to exist in a magnificent website with very many outstanding people with valuable concepts. I feel really blessed to have encountered your webpages and look forward to plenty of more cool minutes reading here. Thank you once again for a lot of things. I enjoy checking out individual blog sites, Mom blogs, etc. What is the most effective method to find these kinds of blog sites online? The best method I have is just following favorites people have – mosting likely to one blog owners “faves” after that the next blog owners faves, and so forth … I’ve tried Google Blogsearch but all that provides me is old newspaper article, and so on. Nothing personal whatsoever … How do you search for individual blogs?.